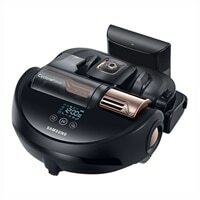 Samsung POWERbot R9350 Turbo WiFi Robot VacuumSave time and effort by letting the Samsung POWERbot handle the vacuuming for you. World's most powerful suction provides optimal cleaning while smart technology allows you to control and monitor your POWERbot from your smartphone. Maximize cleaning coverage as it navigates your home with ease and avoids obstacles. The POWERbot Turbo vacuum is packed with technology and has the world's most powerful suction with 70x more suction power than the leading robot vacuum, delivering optimal cleaning results. Suction power tested on Samsung POWERbot Turbo in comparison with the top selling vacuum by the leading robot vacuum brand according to NPD, 2015. The POWERbot contains an onboard digital camera and nine individual smart sensors that help it determine the optimal cleaning path by creating a complete map of your home. So you don't need to worry about furniture or objects on the floor. Simply turn it on, and let it do the vacuuming for you. The POWERbot features a powerful Cyclone Force system that generates strong centrifugal forces. This separates dirt and debris into an outer chamber to maintain suction power longer with less clogging of filter. Than our previous model. It also automatically transitions from hard floors to most carpet and door thresholds with ease to provide the right type of cleaning action for whatever surface it's on. Save time and effort by letting the Samsung POWERbot handle the vacuuming for you. World's most powerful suction provides optimal cleaning while smart technology allows you to control and monitor your POWERbot from your smartphone. Maximize cleaning coverage as it navigates your home with ease and avoids obstacles.